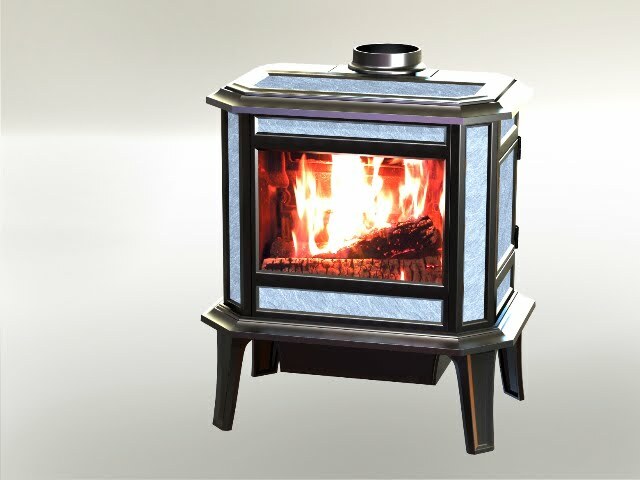 will have the same eight-sided geometry as our popular Fireview model, but will have a larger firebox and higher BTU rating. These are Solidworks models only. The cast iron frame will have more detail than shown in these models but not as much ornamentation as the Fireview. Pictured here with a right hand door, a left hand door will also be available. 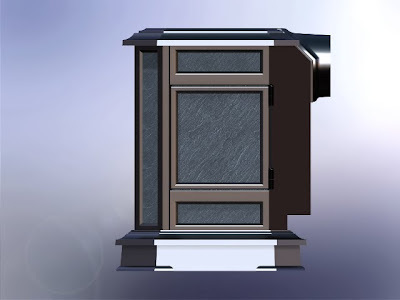 The door has a large soapstone panel. Knob hardware is in the works. 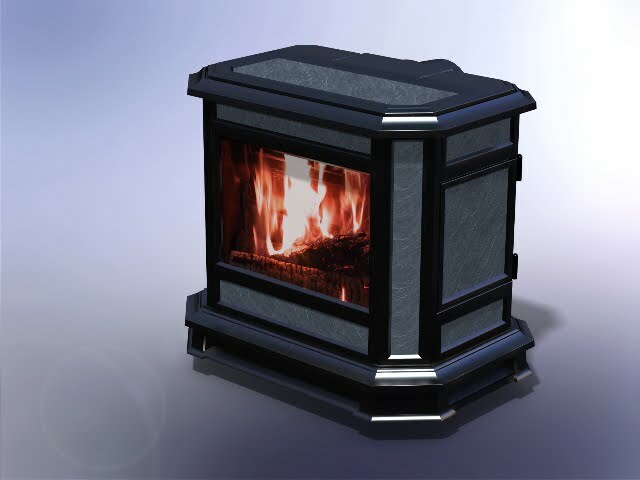 The stove features a 6 inch convertible flue collar so it can be vented from the top or the rear of the stove. An optional ashpan will be available. 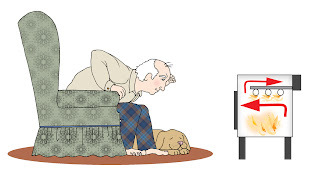 Check back for pictures of the "short leg" model, which is designed to sit down lower for restrictive fireplace installations. We aren't quite ready to show an illustration of the larger stove, but we can say that it will be approximately 32"H x 30"W x 22"D. The design plan is for the same 8-sided configuration as the Fireview, but with a decidedly more contemporary look for the castings. The firebox will be almost 50% bigger than the Fireview. The inside design is completely different from what we have done before as a result of one of our primary goals: MAXIMIZE efficiency and MINIMIZE emissions. 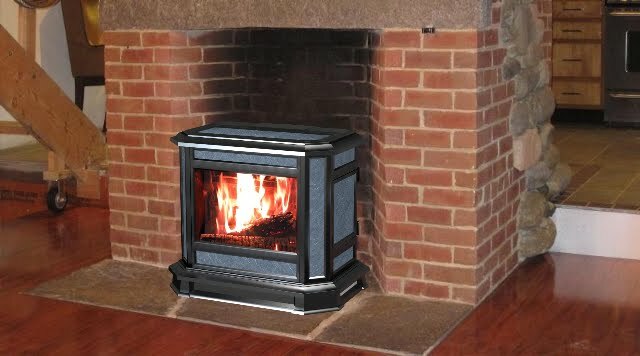 The new stove is truly a "hybrid" in the sense that it has a fully developed "secondary" burn plan and a catalytic combustor. Why both? 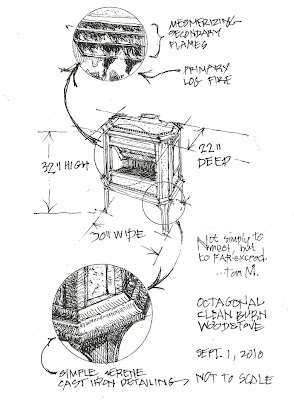 Non-catalytic designs tend not to work very well (1) with wet wood, (2) for very long burns at LOW firing rates, (3) with inexperienced operators (i.e. those who don't get the secondaries lit after a cold start or after re-fueling), or (4) over a very broad range of operating conditions. They are not so good at low burns, very effective at moderate burns, and reasonably effective (to a point) at high burns. 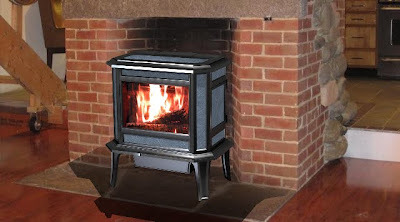 The hybrid has a greater range of output, greater efficiency, and is cleaner. Plus it cleans up carbon monoxide, methane and other combustion by-products - not things we are being graded on by the EPA (yet) but things that matter because they INCREASE efficiency and DECREASE pollution, which we do care about. One thing we like about secondary burning is the view of the secondary flames. 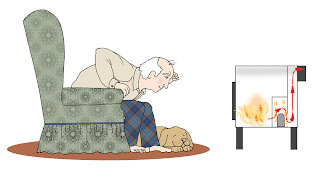 A lot of secondary combustion (non-cat) stoves have tubes under the top of the firebox, or secondary combustion in an insulated rear chamber (see illustrations 1 & 2). 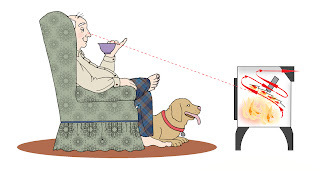 The problem with these designs is that you can't SEE the secondary combustion very well, if at all. In "tube-type" designs, you have to almost scrape your nose on the floor, and in "rear-chamber" designs, the secondary combustion is largely hidden in an insulated box in the rear of the stove. directly under the stovetop, making it difficult to view. This is too bad, because the "secondary" event is just as much fun to watch as the "primary" event. Watching the secondary gasses burning is as mesmerizing as watching the wood "burn". So we have located the secondary combustion air outlet across a fireback sloped to make the secondary activity as visible as possible to the stove owner! of our new stove during test burns.It's quite a show! Please check back with us from time to time. 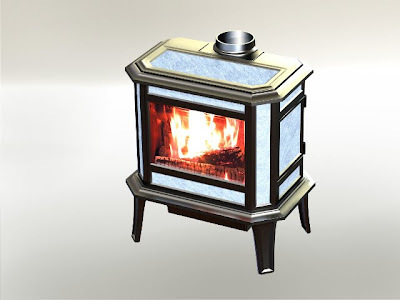 We will add new information as we move along in our development of the new stove and other product improvements as they happen.